It's Hip 2 Serve! : Sam's Club/Box Tops for Education Giveaway! Sam's Club/Box Tops for Education Giveaway! Thanks to Sam's Club and Box Tops for Education, I am excited to announce Hip2Serve's first giveaway! Five of my lucky readers will each receive a FREE one-day pass to Sam's Club and one reader will receive a $25 Sam's Club gift card! 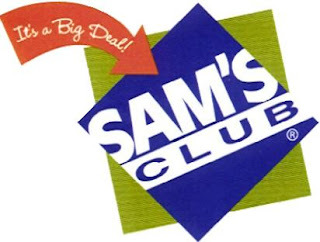 In order to enter this giveaway, please post a comment below letting me know why you would like to shop at Sam's club. Be sure to leave your first name and initial of last name...I will announce the winners on Friday afternoon so be sure to post your comment no later than Thursday, September 10th at midnight EST. Sam's Club sells many back-to-school brands that participate in the Box Tops for Education campaign which makes it easy to save money on great items and earn money for your favorite school! Be sure to check out the Big Clip Campaign where you can register to win one grand prize of 500,000 Bonus Box Tops (a $50,000 value) or one of two first prizes of 250,000 Bonus Box Tops (a $25,000 value) for your school. You can enter once daily through October 31st! $5.00 OFF Clorox Toilet Wand System! Commissary Deals: September 24th-October 7th! Save on Butterball at the Commissary! New $1.50 Tide Stain Release Coupon + More! FREE admission to Six Flags over Georgia!! FREE Oscar Mayer Lunchables at the Commissary!! Commissary Deals: September 10th-September 23rd! FREE Sample Bath & Body Products! Win a Grill at your Local Exchange! FREE Sample & Coupons for Tampax Pearl and More! Borders: 40% OFF + FREE Coffee!! FREE Family Portrait for Deployed Soldiers! !